Your college wall decor is what helps you express your interests and personality. You can add your favorite bands, actors, and movies to your dorm wall art to be surrounded by things you love to make your dorm room feel like a cozy little home. However, maybe you want something a little different in addition to your favorite movie poster. Scenic dorm posters are great additions to dorm room decor. You can have a photo of your favorite place or where you always wanted to visit right on your dorm room walls. Our Eiffel Tower Kiss College Poster is a simple poster for dorm rooms that is sweet and an uncommon view of the Eiffel Tower. Our Eiffel Tower Kiss Poster for Dorm Rooms features a couple kissing with the Eiffel Tower in the backdrop. This dorm wall art dorm essentials item has the Eiffel Tower centered in the photo and it creates a unique college supplies item. When you think of a dorm poster of the Eiffel Tower, you probably think of Eiffel Tower Photographs that are taken right in front of the Eiffel Tower. Not this college supplies product! 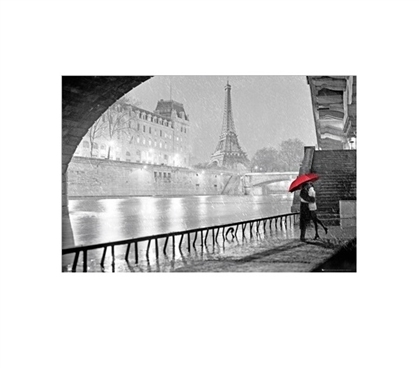 This cheap dorm supplies item has the Eiffel Tower in the distance, which makes this dorm wall art have a pretty view that you can't look away from. This dorm wall art item gets even better with the pop of color from the red umbrella in the bottom right corner of this dorm room decor item!